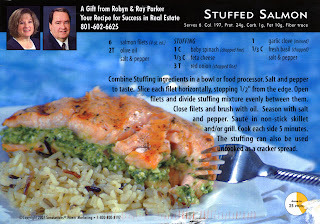 This week's recipe is one of many I've recieved as a postcard from some local realtors. Since I'm pregnant I substituted the feta cheese with grated parmesan. I also served it with lemons and Rice-A-Roni. Get your healthy fish oil and spinach veggies all in one meal. Pretty quick and easy. Combine stuffing ingredients in a bowl or food processor. Salt and pepper to taste. Slice each filet horizontally, stopping 1/2" from the edge. Open filets and divide stuffing mixture evenly between them. Close filet and brush with oil. Season with salt and pepper. Saute in non-stick skillet and/or grill. Cook each side 5 minutes. The stuffing can also be used uncooked as cracker spread.